Archbishop Lefebvre was still a consultor to the Sacred Congregation for the Propagation of the Faith (and he would remain so until 1972) and lived in retirement in Rome, on the via Casalmonferrato, near the via Tusculane. He received visits from helpless young men who wished to receive priestly formation that was in conformity with the Church’s Tradition. He referred them to the University of Fribourg in Switzerland, where the teaching was still orthodox. So it was that on October 13, 1969, he opened the “St. Pius X International Residence” with the encouragement of the local ordinary, Bishop Francois Charriere. Wishing to introduce a year of spirituality before beginning actual seminary studies, the following year Archbishop Lefebvre acquired a parcel of land in Econe, in Valais. Formerly the property of the Canons of the Great St. Bernard, this house opened its doors on October 1, 1970, with the authorization of the local ordinary, Bishop Nestor Adam. One month later, on November 1, 1970, the Society of St. Pius X was officially born, approved and erected by Bishop Charriere, the Bishop of Geneva, Lausanne and Fribourg. On February 18, 1971, the work was the object of a laudatory decree issued by the Prefect of the Sacred Congregation of the Clergy, Cardinal John Wright. Since Archbishop Lefebvre rejected the conciliar reforms, in particular the New Mass promulgated by Paul VI, the seminary had a steady stream of candidates and the first tensions appeared, especially with the French bishops who believed that they could denounce a “maverick seminary”, despite all the approval that the Society enjoyed. In 1973, with the help of his sister, Mother Marie Gabriel, a Spiritan sister, Archbishop Lefebvre founded the Sisters of the Society of St. Pius X to accommodate young women who wished to consecrate themselves to God. Soon a branch of the Brothers of the Society was established, as well as the Oblate Sisters. On May 6, 1975, Bishop Charriere’s successor withdrew the approval of the Society of St. Pius X. Archbishop Lefebvre tried in vain to appeal the decision. The following year, on July 1, 1976, he was declared suspens a divinis by Pope Paul VI because he had continued to ordain priests. That summer witnessed the beginning of resistance on a worldwide scale to the “self-destruction of the Church”. 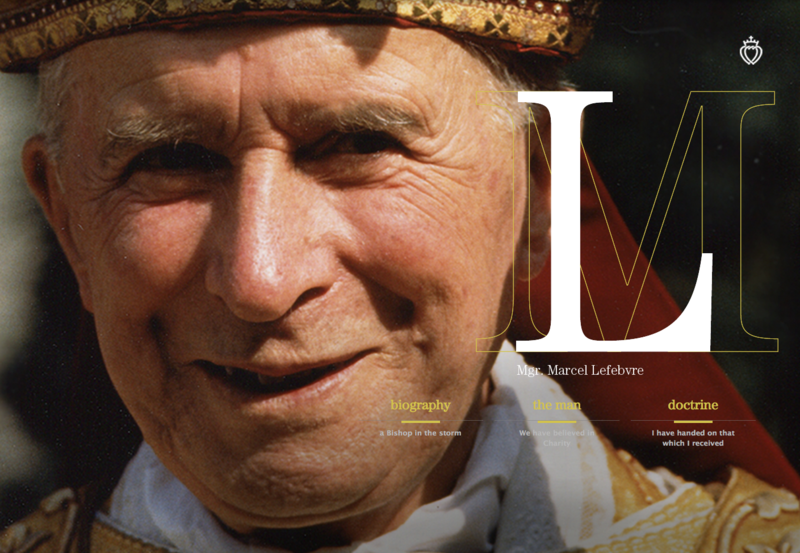 Archbishop Lefebvre had high hopes when John Paul II was elected on October 16, 1978. The new pope received him in audience less than a month later, on November 18, 1978. The doctrinal discussions with the Cardinal Prefect of the Congregation for the Doctrine of the Faith, Joseph Ratzinger, would be inconclusive though. 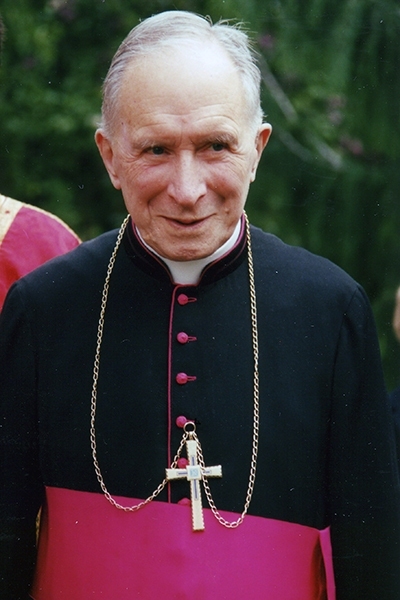 In 1982, Archbishop Lefebvre left the office of Superior General, which was entrusted to Fr. Franz Schmidberger. Two years later, Archbishop Lefebvre wrote to the cardinals to protest against the decision to hold an inter-religious gathering in Assisi (October 27, 1986). In 1987 the response of the Roman authorities to his doubts about the new doctrine of religious liberty convinced him of the gravity of the liberal principles that were now guiding the Holy See. 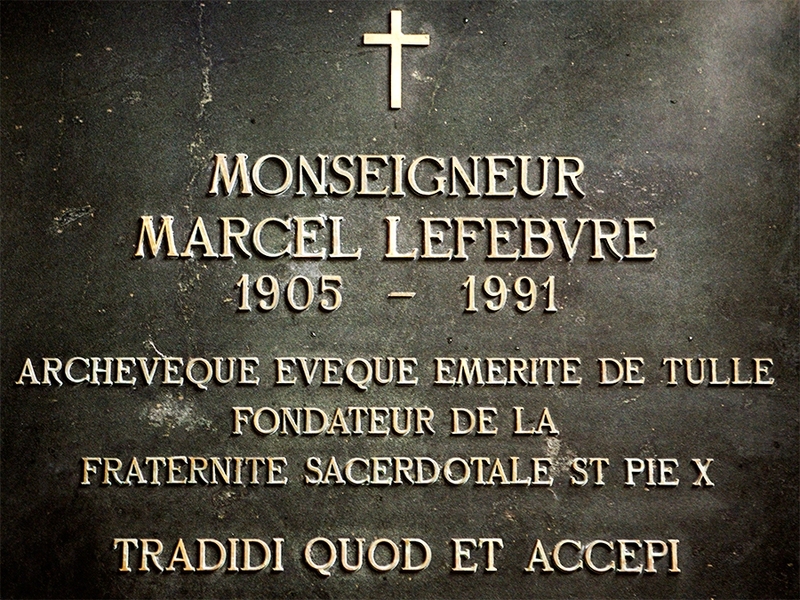 Despite an attempt to obtain canonical recognition in 1987-1988, and given the inadequacy of the guarantees proposed by Rome to assure the perpetuation of his priestly work, Archbishop Lefebvre consecrated four bishops in Econe on June 30, 1988. After a long illness, he died on March 25, 1991, at the hospital in Martigny. He was solemnly buried in Econe on April 2, where he rests in the crypt of the seminary.